Bruce Lang helps with the brewing process. 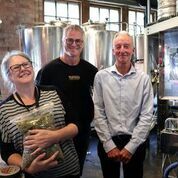 The Cardiac Inherited Diseases Group (CIDG) and Tuatara Brewery have been working together for the past five years to raise awareness about the little-known Cardiac Inherited Disease in memory of a Tuatara team member. Matthew Lang, an Auckland Regional Sales Rep for Tuatara Brewery, passed away suddenly in his sleep in December 20, 2013, at the age of 27 from Long QT Syndrome (LQTS) – just one type of Cardiac Inherited Disease (CID). Tuatara help to minimise the impact of this horrific disease by raising funds for the purchase of AEDs (Advisory External Defibrillator). AED’s are portable defibrillators for at-risk patients with the same condition as Matt and go a long way to saving the lives of people with CID. Sudden cardiac arrest kills more people per year in NZ than die on our roads – 5 people per day and only 9% of them have access to an AED. Matt loved massively hoppy, Pliny-like pale ales, so each year, close to the anniversary of his death, Tuatara brew the Matt Lang Memorial Brew. 100% of proceeds from the sale of the beer are used to fund further AED’s and distributed by CIDG to children and adults diagnosed with the disease. This year the initiative has been co-hosted or ‘co-brewed’ with another of Matts employers, Joylab (formerly Barworks), who spearhead some of Auckland’s best known gastrobars. It’s allowed the beer quantity to be doubled, with the hope of increasing the fundraising efforts for this worthy cause. Joylabs Sweatshop Brew Kitchen have wholeheartedly supported this years extended reach by hosting the collaboration brew and providing the venue for the Auckland launch. L-R – Jackie Crawford, Carl Vasta and Matt’s dad Bruce. On 31 October, Tuatara Master Brewer and Founder Carl Vasta brewed his memorial IPA recipe with Head Brewer Paddy Molloy. The two were supported by Matt’s father, Bruce, who has attended every brew day, as has a representative from CIDG, this year Jackie Crawford (National Co-Ordinator) attended. Official launch events for the Matt Lang Memorial IPA were held on Wednesday 28 November (6pm) at The Third Eye and Friday 30 November (7pm) at Sweatshop Brew Kitchen. The Matt Lang Memorial IPA will be available at several Joylab bars aside from Sweatshop Brew Kitchen – The Flying Moa and The Merchant. It will also be on tap at Tuatara’s Third Eye taproom in Wellingtons CBD, the Kapiti brewery tap room and close friends LBQ, Binn 44 (both in Wellington), My Bar and Brewers Coop (in Auckland).